There are times when I am not too unhappy about my lack of knowledge of languages like Lingala, Swahili, Twi or Yoruba. Even with the very few African languages that I do understand a tiny bit I get irritated by the over-the-top religiousness of some lyrics. 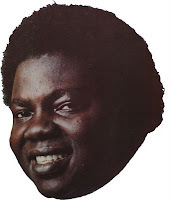 I have a feeling this might be the case as well with the lyrics of Ebenezer Obey. I have read somewhere that he used to be a sinner. Drinking, loose morals and a dose of debauchery, I suppose. Until religion came into his life. Maybe it's those traces of a life of vice that attract me to his earlier work. 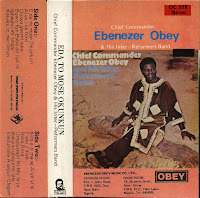 Here's a wonderful cassette from 1975 by Chief Commander Ebenezer Obey and his Inter-Reformers* Band. It comes with a warning: do not play it while driving a car on a motorway with a speed limit!! Yeah! What a great tape! Thank you again for this wonderful share. right on with the Obey!